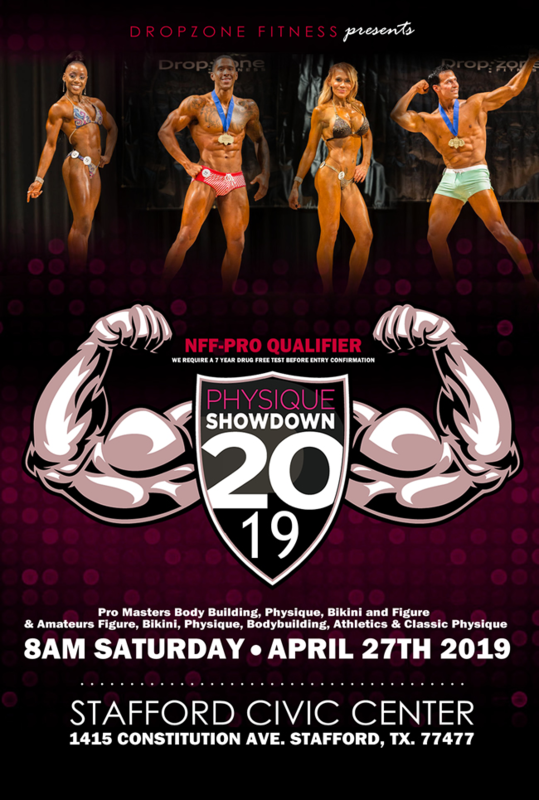 WELCOME TO THE 2019 NFF PHYSIQUE SHOWDOWN. WE ARE LOOKING FORWARD TO SHOWCASING THE ATHLETES OF THE NATURALLY FIT FEDERATION. AS A NATURALLY FIT FEDERATION AMATEUR OR PRO ATHLETE YOU ARE ABLE TO COMPETE WHEN AND WHERE YOU WOULD LIKE. ALSO, THE NATURALLY FIT FEDERATION WELCOMES ALL AMATEURS AND PROS FROM ANY DRUG FREE FEDERATION TO JOIN OUR ATHLETES ON STAGE. IF YOU CAN PASS OUR TEST, YOU CAN COMPETE!!!! NEW: ALL Transformation Athletes will need to schedule a polygraph and Purchase a NFF Membership. Photos and measurements must be taken within 10 days of your registration and can be emailed to naturallybuilt1@gmail.com. You must hold a newspaper that shows the current date of the day the photo is taken. Must be at least 35 years old on Apr 27, 2019. Must be no older than 19 years old on Apr 27, 2019.